By the meaning of equally inclined lines, we mean that the lines which make equal angles with both the co-ordinate axes. 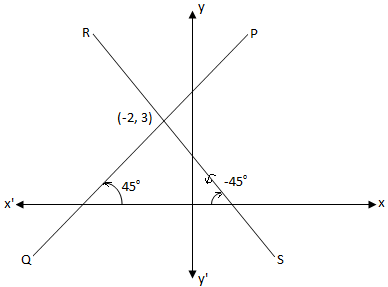 The above diagram shows that PQ and RS are the two equally inclined lines. Therefore, slope = tan 45° = 1. Therefore, slope = tan (-45°) = -1. Find the equation of the lines which is passes through the point (-2. 3) and equally inclined to the co-ordinate axes. 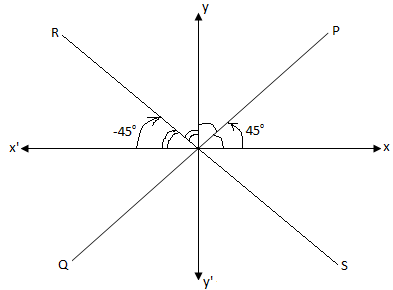 From the above diagram it is clear that; there are two lines PQ and RS, equally inclined to the co-ordinate axes.